Many businesses in Kenya have embraced social media as a way of connecting to their customers as well as attending to their queries and questions. KPLC is one such company. We all know that you can report power outage through calling, via Twitter or even facebook. But did you know that you can do the same by simply texting? 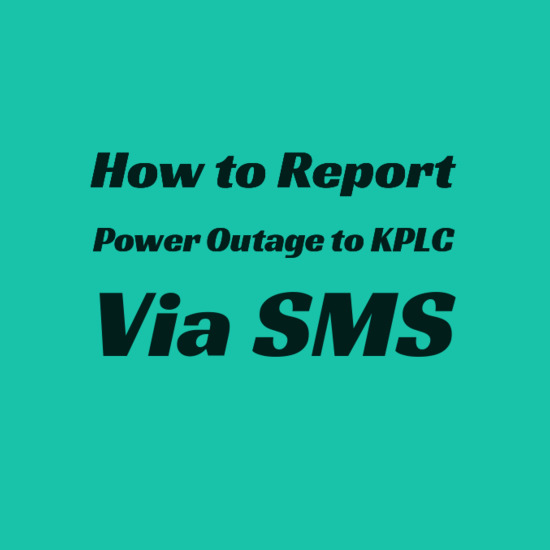 All you need to do is send Stima#AccountNo#Description of Outage to 95551.
e.g. Stima#123456789#No power since yesterday. You will receive a message with a reference number under which your complaint has been booked. This makes it easier for you to follow up on the progress of your case. This service comes in handy when you do not have data bundles to contact them via social media accounts or when you just don’t want to spend your hard earned cash calling their numbers. There’s no reason why you should stay in darkness. Have a bright day. Thanks for the info, it was helpful. How can you be notified of a power outage and you don't do or say anything for a whole 26 hrs and counting!! It's sad tha a big company like Kenya power is using non functioning website. It is really unfortunate that you don't respond to any comments. We have a transformer at Darajambili, Maseno which switches off at the slightest whiff of rain. This is after our earlier transformer exploded and replaced. However, the alleged new transformer has not lived to our expectations.It goes off at any time especially during this rainy period while other nearby transformers are working. Can you tell exactly what is wrong. Or is it overloaded? 3 days no power despite numerous phone calls with fake promises. What is happening. There has been low voltage and when i sent the sms i was notified my account is not registered, yet i buy units with it. How now? Still waiting for the transformer at nyaundi primary in kisumu county to be fixed since December 2017 in spite of several reports and the men even coming to the ground to inspect. Even having reported of transformer exploding and yet no action taken even after making calls that are not responded to. 4 days after at mwiki kasarani, nyawai academy. There is an unresolved complaint for the account with the number 3938293 as refference. It is in the status Pending. when you call the normally say they have one team which covers the all of south coast and told its in lunga lunga that was on Thursday, on Friday i was told its in kwale ,after they have other issues to attended. calling again the line is busy or ringing no one picks it. why having one team the whole of ukunda??”?? all the track moving around ukunda what are they doing. its too much with poor servce from the power ukunda .